DIE Jovis, 1o Februarii, 1738. Epus. Bristol. Ds. Hardwicke, Cancellarius. Comes Godolphin, C. P. S.
His Majesty, being seated on the Throne, adorned with His Crown and Regal Ornaments, and attended with His Officers of State; the Prince of Wales, (in his Robes), sitting in his Place on His Majesty's Right Hand; the Lords being also in their Robes; commanded the Gentleman Usher of the Black Rod to let the Commons know, "It is His Majesty's Pleasure, that they attend Him immediately, in this House." "I have, upon all Occasions, declared how sensibly I have been affected with the many Hardships and Injuries sustained by My trading Subjects in America. I have the Honour of My Crown and the true Interest of My People too much at Heart, to see either of them suffer any Prejudice or Diminution, without pursuing the most proper and advantageous Methods for their real Security and Preservation. "These Considerations alone were sufficicent to incite Me to exert My utmost Power, in vindicating and protecting our undoubted Rights and Privileges of Navigation and Commerce: And nothing could add to My Own Zeal, in so just a Cause, but the due Regard I always have to the Petitions and Complaints of My Subjects, and the Advice of My Parliament. The Wisdom and Prudence of your Resolutions, upon this great and National Concern, determined Me to begin with the more moderate Measures; and to try, once more, what Effect and Influence My friendly Endeavours and pressing Instances would have upon the Court of Spain, towards obtaining that Satisfaction and Security which we were entitled to demand and expect; and your Assurances, to support Me in all Events, enabled Me to proceed with proper Weight and Authority. "Thus supported by the concurrent Advice of both Houses of Parliament, I lost no Time in making Preparations to do Myself and My People Justice, if the Conduct of the Court of Spain had laid us under that Necessity; and at the same Time I did, in the strongest Manner, repeat My Instances for obtaining such Justice and Reparation for the many Injuries and Losses already sustained, and such an effectual Security for the future, as might prevent the Consequences of an open Rupture. "It is now a great Satisfaction to Me, that I am able to acquaint you, that the Measures I have pursued have had so good an Effect, that a Convention is concluded and ratified between Me and the King of Spain; whereby, upon Consideration had of the Demands on both Sides, that Prince hath obliged Himself to make Reparation to My Subjects for their Losses, by a certain stipulated Payment; and Plenipotentiaries are therein named and appointed, for regulating, within a limited Time, all those Grievances and Abuses which have hitherto interrupted our Commerce and Navigation in the American Seas, and for settling all Matters in Dispute in such a Manner as may, for the future, prevent and remove all new Causes and Pretences of Complaint, by a strict Observance of our mutual Treaties, and a just Regard to the Rights and Privileges belonging to each other. I will order the Convention, and the separate Articles, to be laid before you. "It hath been My principal Care, to make Use of the Confidence you reposed in Me, in this critical and doubtful Conjuncture, with no other View but the general and lasting Benefit of My Kingdoms; and, if all the Ends which are to be hoped for, even from successful Arms, can be attained without plunging the Nation into a War, it must be thought, by all reasonable and unprejudiced Persons, the most desirable Event. "I have ordered the proper Estimates to be prepared, and laid before you, for the Service of the current Year. I heartily wish that the Posture of Affairs would have permitted Me to retrench the public Expences, for which I am obliged to demand the present Supplies; and I make no Doubt but your experienced Zeal and Affection for Me and My Government, and the proper Concern you have always shewn for the public Good, will induce you to grant Me such Supplies as you shall find necessary for the Honour and Security of Me and My Kingdoms. "I cannot but earnestly recommend it to you, not to suffer any Prejudices or Animosities to have a Share in your Deliberations at this important Conjuncture; which seems, in a particular Manner, to call upon you to unite in carrying on such Measures as will be most conducive to the true Interest and Advantage of My People." Their Lordships having, together with Robert Lord Bishop of Ely, Thomas Lord Bishop of Norwich, and Joseph Lord Bishop of Bristol, at the Table, first taken the Oaths, and made and subscribed the Declaration, and also took and subscribed the Oath of Abjuration, pursuant to the Statutes. It was moved, "To order, That an humble Address be presented to His Majesty, to return Him the Thanks of this House, for His most Gracious Speech from the Throne; and for the just Concern His Majesty hath expressed for the many Hardships and Injuries sustained by His Trading Subjects in America, and for the Honour of His Crown, and the true Interest of His People. "To declare, that we are deeply sensible of the Gracious Regard which His Majesty is pleased to express for the Advice of His Parliament; and that, though His Majesty was induced to begin with the more moderate Measures, yet this House never entertained the least Doubt of His Readiness to exert His utmost Power, in vindicating and protecting our undoubted Rights of Navigation and Commerce, and in doing Himself and His People Justice, if the Conduct of the Court of Spain had made such Measures necessary. "Humbly to thank His Majesty for His great Goodness, in acquainting us, from the Throne, with the Convention concluded and signed between His Majesty and the King of Spain; and that He will be pleased to order it to be laid before us. "To declare, that we have the most unfeigned Gratitude for His Majesty's Royal Care to make Use of the Confidence reposed in Him, for the general and lasting Benefit of His Kingdoms; and that, as Reparation for past Injuries and Losses, and effectual Security for the future, have been the great Views in this important Affair, if those Ends can be attained without plunging the Nation into a War, it must give the truest Satisfaction to all His faithful Subjects. "To assure His Majesty, that we will carefully avoid all Animosities and Prejudices; and that we will zealously and chearfully concur in all such Measures as shall be most conducive to the Security of His Majesty's Person and Government, and the true Interest of His People." It was proposed, "To leave out the 2d, 3d, and 4th Paragraphs." The Question was put, "Whether the said Paragraphs shall stand Part of the Question?" Then an Order was made, upon the foregoing Motion. E. Fitzwalter. L. Bp. Ely. L. B. St. Asaph. Ld. Delawarr. The House was adjourned during Pleasure; and the Committee withdrew, to draw the Address. And the Duke of Portland reported from the said Committee, "That they had prepared an Address, pursuant to the aforementioned Order." "We, Your Majesty's most dutiful and loyal Subjects, the Lords Spiritual and Temporal in Parliament assembled, beg Leave to return Your Majesty our humble Thanks, for Your most Gracious Speech from the Throne. "Amongst the many convincing Proofs which Your Majesty hath given of Your paternal and unwearied Care of the Rights of Your People, nothing can fill their Hearts with more grateful Sentiments; than that sincere and affectionate Concern which You have so often declared, for the many Hardships and Injuries sustained by Your Trading Subjects in America. The Honour of Your Majesty's Crown, and the true Interest of Your People, are, and ever will be, inseparable: And, as Your Majesty hath, on all Occasions, demonstrated to the World, that You have both equally at Heart, it was impossible for us not to have the firmest Dependance on Your Zeal and Vigilance for their real Security and Preservation. "The gracious Regard which Your Majesty is pleased to express for the Resolutions and Advice of Your Parliament, is a great Instance of Your Royal Goodness. And though Your Majesty's constant Desire, out of Tenderness for Your People, to avoid involving these Kingdoms in the manifold Inconveniencies of War, must incline You to approve the Beginning with more moderate Measures; yet we never entertained the least Doubt but that true Greatness and Fortitude, which inspire Your Royal Breast, would induce You to exert Your utmost Power, in vindicating and protecting our undoubted Privileges of Navigation and Commerce, and in doing Justice to Yourself and Your Subjects, if the Conduct of the Court of Spain had made such Methods necessary. "We beg Leave, on this Occasion, to offer to Your Majesty our unfeigned Thanks, for Your great Goodness and Condescension, in acquainting us, from the Throne, that a Convention is concluded and ratified between Your Majesty and the King of Spain, whereby Reparation is agreed to be made to Your Subjects for their Losses, by a certain stipulated Payment, and Plenipotentiaries are appointed for regulating, within a limited Time, all those Grievances and Abuses, which have hitherto interrupted our Commerce and Navigation in the American Seas; and that Your Majesty will be pleased to order the Convention, and separate Articles, to be laid before us. "We should fall short of those warm Impressions of Gratitude which we feel in ourselves, as well as be wanting in our Duty, if we did not return Your Majesty our most thankful Acknowledgements, for Your Royal Care in making Use of the Confidence reposed in Your Majesty, with no other View but the general and lasting Benefit of Your Kingdoms. 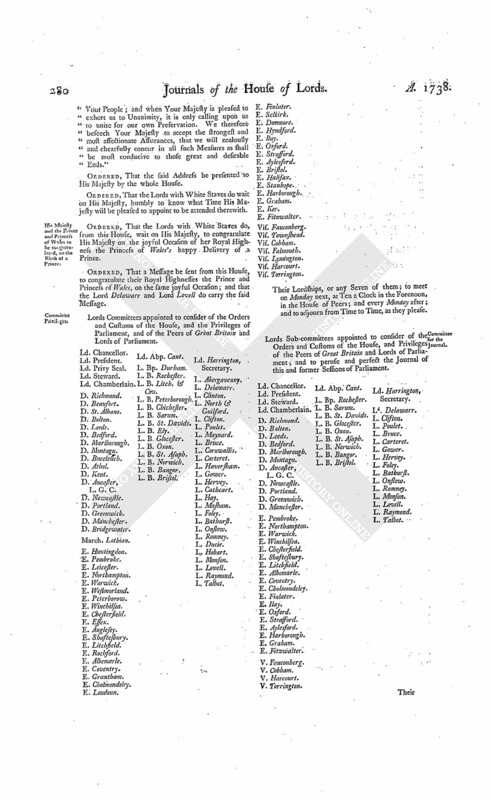 Reparation for past Injuries and Losses, and effectual Security for the future, founded in Justice, and warranted by Treaties, have been the great Views of Your Majesty and Your Parliament in this National and important Affair; and if those Purposes can be attained, without plunging the Nation into a War, it must give the truest Satisfaction to all Your faithful Subjects, who cannot but be as defirous to preserve the Peace, as they are able and ready to defend and vindicate their Rights against the Encroachments of all Aggressors. "We are deeply sensible how unbecoming and pernicious it would be, at any Time, to suffer either Prejudices or Animosities to mix themselves with Parliamentary Deliberations; and Your Majesty's Gracious Recommendation to us, particularly to avoid them at this important Conjuncture, cannot fail to awaken in us a more than ordinary Caution on that Head. Great Britain hath but one common Interest, consisting in the Security of Your Majesty's Person and Government, and the Welfare and Happiness of Your People; and when Your Majesty is pleased to exhort us to Unanimity, it is only calling upon us to unite for our own Preservation. We therefore beseech Your Majesty to accept the strongest and most affectionate Assurances, that we will zealously and chearfully concur in all such Measures as shall be most conducive to those great and desirable Ends." Ordered, That the Lords with White Staves do wait on His Majesty, humbly to know what Time His Majesty will be pleased to appoint to be attended therewith. His Majesty and the Prince and Princess of Wales to be congratulated, on the Birth of a Prince. Ordered, That the Lords with White Staves do, from this House, wait on His Majesty, to congratulate His Majesty on the joyful Occasion of her Royal Highness the Princess of Wales's happy Delivery of a Prince. Ordered, That a Message be sent from this House, to congratulate their Royal Highnesses the Prince and Princess of Wales, on the same joyful Occasion; and that the Lord Delawarr and Lord Lovell do carry the said Message. 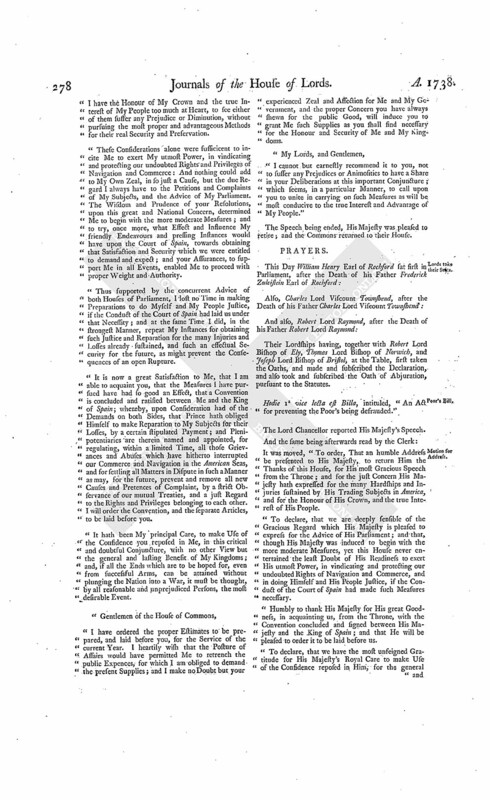 Lords Committees appointed to consider of the Orders and Customs of the House, and the Privileges of Parliament, and of the Peers of Great Britain and Lords of Parliament. Vis. Torrington. Ld. Abp. Cant. L. B. Bristol. Ld. Harrington, Secretary. Their Lordships, or any Seven of them; to meet on Monday next, at Ten a Clock in the Forenoon, in the House of Peers; and every Monday after; and to adjourn from Time to Time, as they please. Lords Sub-committees appointed to consider of the Orders and Customs of the House, and Privileges of the Peers of Great Britain and Lords of Parliament; and to peruse and perfect the Journal of this and former Sessions of Parliament. V. Torrington. Ld. Abp. Cant. It is thereupon Ordered, by the Lords Spiritual and Temporal in Parliament assembled, That the High Steward of the City of Westminster, or his Deputy, together with the Justices of the Peace for the said City, shall, by their Care and Directions to the Constables and other Officers within the said Limits, take special Order, that no empty Hackney Coaches be suffered to make any Stay, between Whitehall and The Old Palace Yard in Westminster, from Eleven of the Clock in the Forenoon until Five of the Clock in the Afternoon of the same Day, during the Sitting of this Parliament; and that no Carriages, Drays, or Carts, be permitted to pass through the said Streets and Passages, between Charing Cross and The Old Palace Yard, between the Hours aforesaid, during the Sitting of this Parliament; and herein special Care is to be taken, by the said Deputy Steward, Justices of the Peace, Constables, and all other Officers herein concerned, as the contrary will be answered to this House: And it is further Ordered, That the High Bailiff of the City of Westminster, and the Justices of the Peace for the City and Liberty thereof, or some of them, residing in Westminster, be served with the Order of this House, made this Day, for the Purposes aforesaid. Dominus Cancellarius declaravit præsens Parliamentum continuandum esse usque ad et in diem Veneris, secundum diem instantis Februarii, hora undecima Auroræ, Dominis sic decernentibus. Dux Atholl, & Ds. Strange. The Lord Steward reported to the House, "That the Lords with White Staves (pursuant to the Order of Yesterday) had waited on His Majesty, to congratulate Him on the joyful Occasion of her Royal Highness the Princess of Wales's happy Delivery of a Prince; and that His Majesty was pleased to return His Thanks to this House, for their Congratulation upon this happy Occasion; and to receive it very Graciously." His Majesty to be at ended with Address. His Grace likewise reported, "That the Lords with White Staves (according to Order) had also waited on His Majesty, to know what Time He would be pleased to appoint to be attended by this House, with their Address; and that His Majesty had been pleased to appoint this Day, at Two a Clock, at His Palace of St. James's." Bramston & al. Pet. referred to Judges. 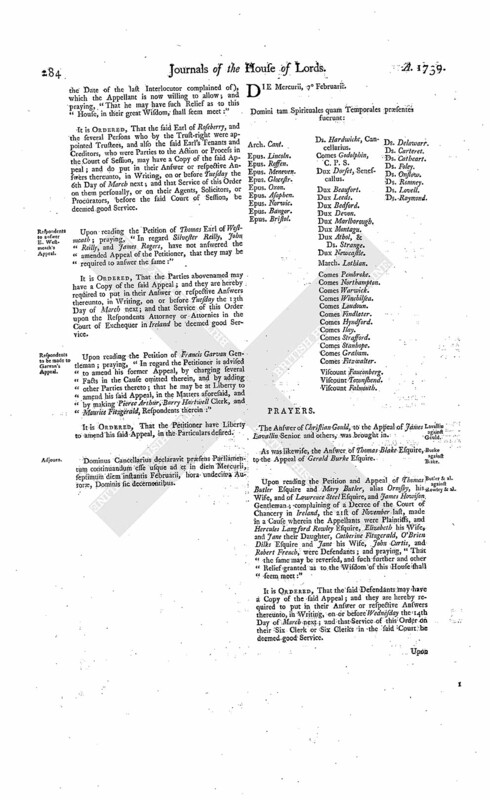 It is Ordered, That the Consideration of the said Petition be, and is hereby, referred to the Lord Chief Baron of the Court of Exchequer and Mr. Baron Parker; who are forthwith to summon all Parties concerned in the Bill; and, after hearing them, to report to the House the State of the Case, with their Opinion thereupon, under their Hands, and whether all Parties that may be concerned in the Consequences of the Bill have signed the Petition; and also that the Judges, having perused the Bill, do sign the same. Murray against Sir J. Dalrymple & al. Upon reading the Petition and Appeal of Mr. Hugh Murray Kynnynmound of Melgund and Kynnynmound, Advocate, the only acting Trustee under the last Settlement of Sir James Rochead of Innerleith Baronet, deceased, on Behalf of all the Persons for whose Behoof the said Settlement or Trust Deed is granted, and James Dalrymple an Infant, Second Son of Sir James Dalrynple of Haills, Baronet, by Mr. Hugh Somervill Writer to His Majesty's Signet at Edinburgh, his Tutor ad Lites; complaining of an Interlocutor, or Decree, of the Lords of Session in Scotland, of the 23d of June 1738, and of their Adherence thereunto, the 6th of July following; and likewise of an Interlocutor of the Lord Ordinary, of the same 23d of June; and also of an Interlocutor of the said Lords of Session, of the 29th of the same July, made on the Behalf of Sir James Dalrymple Baronet, and Hugh, Charles, and John Dalrymple, Sons of the said Sir James Dalrymple, Sir Francis Kinloch Baronet and Dame Mary his Wife, Francis Kinloch, David Kinloch, and Alexander Kinloch, Sons of the said Sir Francis Kinloch by the said Dame Mary his Wife, James Cathcart Esquire, and Mrs. Elizabeth Rochead Spinster, Alexander Hamilton of Pencaitland Esquire, Thomas (fn. 1) Dundas of Lethem, and John Rochead Merchant in Edinburgh, and the Tutors and Curators of such of them as are Infants; and praying, "That the said Interlocutors may be reversed or varied; and that the Appellant may have such Relief as to the House shall seem meet:"
It is Ordered, That the several Parties last named may have a Copy of the said Appeal; and they are hereby required to put in their Answer or respective Answers thereunto, in Writing, on or before Friday the Second Day of March next; and that Service of this Order on their Agents or Procurators be deemed good Service. Pleadings proved in several Causes. He was thereupon called in; and delivered, at the Bar, the said Papers; and attested upon Oath, "That the same were true Copies, he having examined them with the Originals in the proper Offices in Ireland." He also delivered in, at the Bar, certain Articles of Agreement and Settlements; together with an attested Copy of a Letter, signed "Mar. Tattle," in the Pleadings mentioned, by Direction of the Court of Exchequer in Ireland, to be made Use of on the Appeal brought by Robert Edgworth Gentleman, a Minor, by his Guardian; the said Writings being sealed up by the Chief Remembrancer of the said Court, or his Deputy, in order to be lodged with the Clerk of this House, if their Lordships should think fit. And then the said Brereton was directed to withdraw. Ordered, That the said Writings be accordingly lodged with the said Clerk, till the Hearing of the said Appeal, and till the further Order of this House. Ordered, That the Cause wherein Andrew Scot and others are Appellants, and the Magistrates of Glasgow Respondents, which, pursuant to the Standing Order of this House, stands to be heard on Monday next, be heard on the Wednesday following; and the other Causes appointed for hearing last Session of Parliament, but not then determined, to come on in Course on the next Cause-days. Dominus Cancellarius declaravit præsens Parliamentum continuandum esse usque ad et in diem Martis, sextum diem instantis Februarii, hora undecima Auroræ, Dominis sic decernentibus. L. Montjoy takes his Seat. This Day Herbert Lord Montjoy sat first in Parliament, after the Death of his Father Thomas Lord Montjoy; having, at the Table, first taken the Oaths, and made and subscribed the Declaration, and also took and subscribed the Oath of Abjuration, pursuant to the Statutes. His Majesty's Answer to Address. "I thank you for this dutiful and affectionate Address; and for the Dependence you express on My Care, to make Use of the Confidence you repose in Me, for the general Benefit of My People. You may rely on the Continuance of My Endeavours to perfect the Accommodation with the Court of Spain, in such a Manner, as may be most for the Honour of My Crown, and the true Interest of My Kingdoms; and that I will pursue such Measures as shall appear to be most conducive to the future Security of the Trade and Navigation of My Subjects." P. of Wales's Answer to congratulatory Message. The Lord Delawarr reported to the House, "That he and the Lord Lovell (pursuant to the Order on Friday last) had attended their Royal Highnesses the Prince and Princess of Wales, with the Message to congratulate them on the joyful Occasion of her Royal Highness's happy Delivery of a Prince; and that His Royal Highness was pleased to say, "He and the Princess were sensible of this Mark of the Duty of the House to the King, and Regard to them." Dillon & al. against Attorney General of Ireland. Upon reading the Petition and Appeal of Robert Dillon and Thomas Dillon, and of Ambrose Farrell and Christian Dillon, Executors of Theobald Dillon Merchant, deceased; complaining of a Decree of the Court of Exchequer in Ireland, of the 26th Day of November 1737, made in a Cause wherein Robert Jocelyn Esquire, His Majesty's Attorney General of that Kingdom, was Plaintiff, and the Appellants Defendants; and likewise of the Report made by the Deputy Remembrancer of the said Court, and the subsequent Orders made in the said Cause; and praying, "That the same may be reversed; and that the said Attorney General's Information may be dismissed; or that the Appellants may have such Relief as to the House shall seem meet:"
It is Ordered, That the said Robert Jocelyn Esquire, His Majesty's Attorney General of Ireland, may have a Copy of the said Appeal; and he is hereby required to put in his Answer thereunto, in Writing, on or before Tuesday the 13th Day of March next; and that Service of this Order on his Attorney in the said Court of Exchequer be deemed good Service. Upon reading the Petition and Appeal of George Hartpole Esquire, Son and Heir of William Hartpole Esquire, deceased; complaining of an Order, or Decree of Dismission, of the Court of Chancery in Ireland, of the 27th Day of July last, made on the Behalf of Hunt Walsh, John Tench, Philip Tench, and Robert Puisant; and praying, "That the same may be reversed and set aside, and such other Order made, for the Appellant's Relief, as to the great Wisdom and Justice of this House shall seem meet:"
It is Ordered, That the several Persons last named may have a Copy of the said Appeal; and they are hereby required to put in their Answer or respective Answers thereunto, in Writing, on or before Tuesday the 13th Day of March next; and that Service of this Order on their Six Clerks in the said Court of Chancery in Ireland be deemed good Service. V. Garneck against E. Glasgow & al. Upon reading the Petition and Appeal of George Viscount of Garnock, an Infant, by John Craufurd Esquire, his Uncle, Guardian, and next Friend, and the same John Craufurd for himself; complaining of Two Interlocutory Sentences of the Lords of Session in Scotland, of the 10th of February 1735/6, and 15th of July 1736, made on the Behalf of John Earl of Glasgow, William Maull of Panmuir Esquire, George Dundass of Dudingstone, William Boyle of Shewaltoun, Archibald Brown of Greenbank, William Borthwick of Falahill, Doctor John Johnstone Physician in Glasgow, and Robert Simpson Professor of Mathematicks in the University of Glasgow; and praying, "That the same may be reversed; and that the Appellants may have such Relief as to this House, in their great Wisdom, shall seem meet:"
It is Ordered, That the several Parties last named may have a Copy of the said Appeal; and they are hereby required to put in their Answer or respective Answers thereunto, in Writing, on or before Tuesday the 6th Day of March next; and that Service of this Order personally on the said Respondents, or their Procurators or Agents in the Cause before the Court of Session, be deemed good Service. Murray & al. against Blair & al. 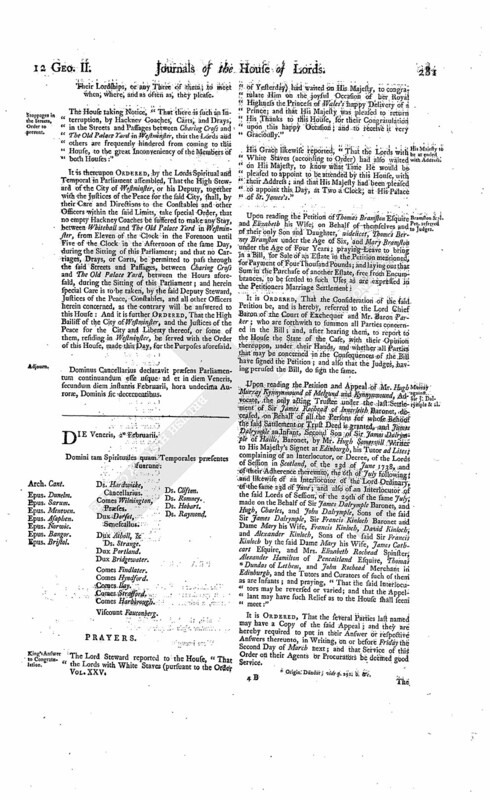 Upon reading the Petition and Appeal of Mr. Archibald Murray Advocate, Mr. James Baillie and James Armour Writers to the Signet, and William Robinson Writer in Edinburgh, Trustees for, and Assignees by, the Creditors of Mr. William Scott, alias Blair, of that Ilk, Advocate; complaining of an Interlocutory Sentence of the Lords of Session in Scotland, of the 9th of July 1736, and of their Adherence thereto, the 30th of the same Month; and likewise of an Interlocutor of the Lord Ordinary, of the 13th of the same July, made on the Behalf of Hamilton Blair and his Guardians; and praying, "That the same may be reversed; and that the Appellants may have such Relief as to this House shall seem meet:"
It is Ordered, That the said Hamilton Blair and his Guardians may have a Copy of the said Appeal; and they are hereby required to put in their Answer or respective Answers thereunto, in Writing, on or before Tuesday the 6th Day of March next; and that Service of this Order on their Counsel, or Agent, in the said Court of Session in Scotland, be deemed good Service. Geddes against E. Roseberry & al. Upon reading the Petition and Appeal of Robert Geddes of Scotstoun Esquire; complaining of an Interlocutor of the Lords of Session in Scotland, of the 14th of January 1736/7, and so much of the Interlocutories of the 28th of July and 8th of November 1737 as tend to the setting aside the Effect of the Appellant's Arrestments (except in so far as the same may be understood to touch or concern so much of the Aliments as the Trustees for James Earl of Roseberry's Creditors had actually paid to the said Earl and his Family, preceding the Date of the last Interlocutor complained of), which the Appellant is now willing to allow; and praying, "That he may have such Relief as to this House, in their great Wisdom, shall seem meet:"
It is Ordered, That the said Earl of Roseberry, and the several Persons who by the Trust-right were appointed Trustees, and also the said Earl's Tenants and Creditors, who were Parties to the Action or Process in the Court of Session, may have a Copy of the said Appeal; and do put in their Answer or respective Answers thereunto, in Writing, on or before Tuesday the 6th Day of March next; and that Service of this Order on them personally, or on their Agents, Solicitors, or Procurators, before the said Court of Session, be deemed good Service. Respondents to answer E. Westmeach's Appeal. 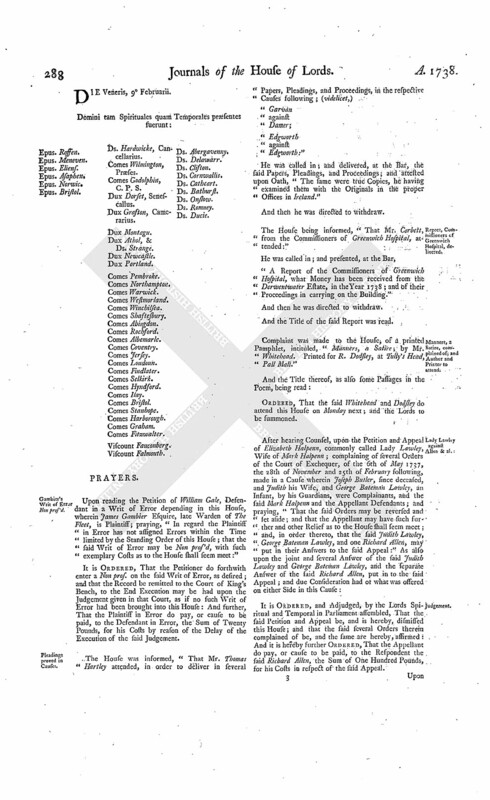 Upon reading the Petition of Thomas Earl of Westmeath; praying, "In regard Silvester Reilly, John Reilly, and James Rogers, have not answered the amended Appeal of the Petitioner, that they may be required to answer the same:"
It is Ordered, That the Parties abovenamed may have a Copy of the said Appeal; and they are hereby required to put in their Answer or respective Answers thereunto, in Writing, on or before Tuesday the 13th Day of March next; and that Service of this Order upon the Respondents Attorney or Attornies in the Court of Exchequer in Ireland be deemed good Service. Respondents to be made to Garvan's Appeal. 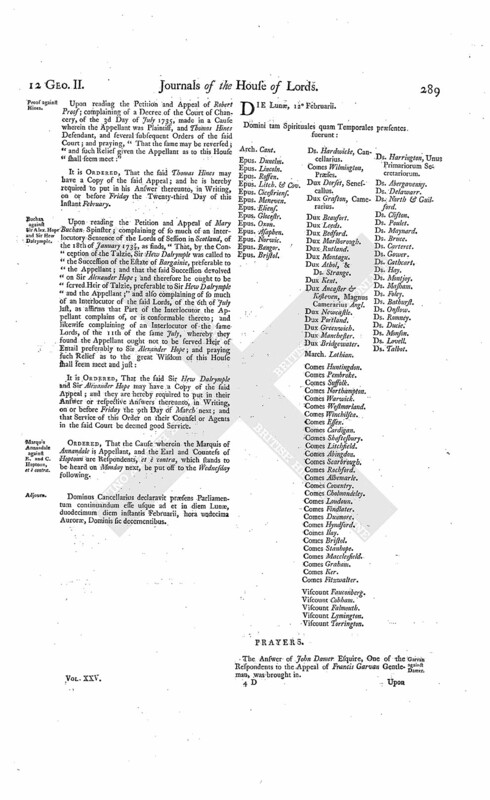 Upon reading the Petition of Francis Garvan Gentleman; praying, "In regard the Petitioner is advised to amend his former Appeal, by charging several Facts in the Cause omitted therein, and by adding other Parties thereto; that he may be at Liberty to amend his said Appeal, in the Matters aforesaid, and by making Pierce Arthur, Barry Hartwell Clerk, and Maurice Fitzgerald, Respondents therein:"
It is Ordered, That the Petitioner have Liberty to amend his said Appeal, in the Particulars desired. Dominus Cancellarius declaravit præsens Parliamentum continuandum esse usque ad et in diem Mercurii, septimum diem instantis Februarii, hora undecima Auroræ, Dominis sic decernentibus. The Answer of Christian Gould, to the Appeal of James Lavallin Senior and others, was brought in. As was likewise, the Answer of Thomas Blake Esquire, to the Appeal of Gerald Burke Esquire. Butler & al. against Rowley & al. 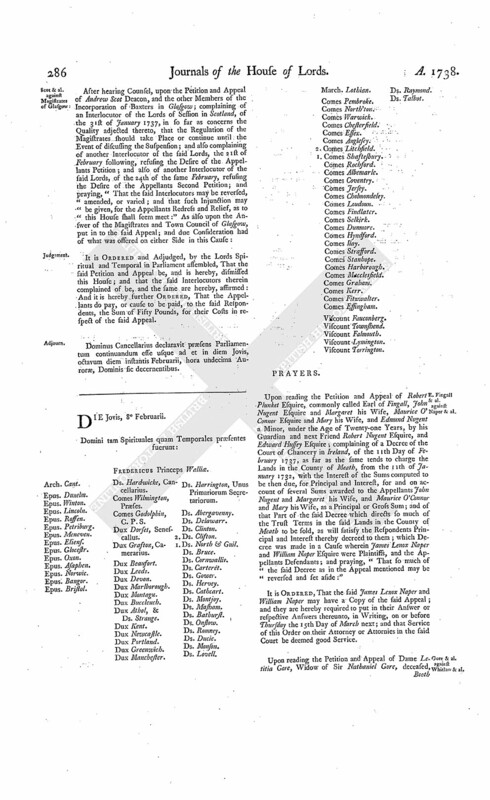 Upon reading the Petition and Appeal of Thomas Butler Esquire and Mary Butler, alias Ormsby, his Wife, and of Lawrence Steel Esquire, and James Howison Gentleman; complaining of a Decree of the Court of Chancery in Ireland, the 21st of November last, made in a Cause wherein the Appellants were Plaintiffs, and Hercules Langford Rowley Esquire, Elizabeth his Wife, and Jane their Daughter, Catherine Fitzgerald, O'Brien Dilks Esquire and Jane his Wife, John Curtis, and Robert French, were Defendants; and praying, "That the same may be reversed, and such further and other Relief granted as to the Wisdom of this House shall seem meet:"
It is Ordered, That the said Defendants may have a Copy of the said Appeal; and they are hereby required to put in their Answer or respective Answers thereunto, in Writing, on or before Wednesday the 14th Day of March next; and that Service of this Order on their Six Clerk or Six Clerks in the said Court be deemed good Service. Sir Hew Dalrymple against Sir Alexander Hope & al. Upon reading the Petition and Appeal of Sir Hew Dalrymple, alias Hamilton, Baronet; complaining of an Interlocutory Sentence of the Lords of Session in Scotland, of the 18th of January, 1737/8, in as far as it finds, by the Conception of the Talzie in the Appeal mentioned, the Succession to the Estate of Barganie devolved upon Sir Alexander Hope, Eldest Son of the only Daughter of John Lord Bargainie, and that he ought to be served Heir of Talzie preferable to the Appellant, made on the Behalf of Sir Alexander Hope and Miss Mary Buchan; and praying, "That the said Interlocutory Sentence may be reversed; and that the Interlocutor of the said Lords of Session of the 16th of July 1736, may be affirmed; and that such Relief may be given to the Appellant as to this House shall seem meet:"
It is Ordered, That the said Sir Alexander Hope and Miss Mary Buchan may have a Copy of the said Appeal; and they are hereby required to put in their Answer or respective Answers thereunto, in Writing, on or before Wednesday the 7th Day of March next; and that Service of this Order on their Counsel or Agents in the said Court be deemed good Service. Monro against Polson & al. Upon reading the Petition and Appeal of David Monro, Writer to the Signet; complaining of the First Part of an Interlocutory Sentence of the Lords of Session in Scotland, of the 7th of January 1737/8, whereby the Lords found sufficient Evidence to presume, that the Reversion granted to David Monro was no proper Estate in him, but that his Name was only made Use of for the Behoof of John Monro his Father; and also of an Interlocutory Sentence of the same Lords, of the 6th of July 1738, adhering to their former Interlocutor; and likewise of an Interlocutor of the Lord Ordinary, of the 19th of the same Month, made on the Behalf of John Polson, James Cuthbert, Alexander Ross of Easterfearn, Roderick Macleod, John Davidson, William Duff, Thomas Ross, Alexander Ross of Ankerville, Alexander Ross Writer to the Signet, John Baillie, William Ross of Sandwick Writer in Edinburgh, Andrew Barclay, William Reid, Charles Robertson, Daniel Forbes, Malcolm Ross, Daniel Ross, and William Frazer; and also the Representatives of Captain David Ross; William Ross late Baillie of Tayne, Andrew Barclay, and Anna Macleod, who are lately dead; and praying, "That the same may be reversed, and such Relief granted as to the great Wisdom of this House shall seem meet:"
It is Ordered, That the several Parties last named may have a Copy of the said Appeal; and they are hereby required to put in their Answer or respective Answers thereunto, in Writing, on or before Wednesday the 7th Day of March next; and that Service of this Order upon them, or their Agents before the said Court, be deemed good Service. Respondents to answer Garvan's Appeal. 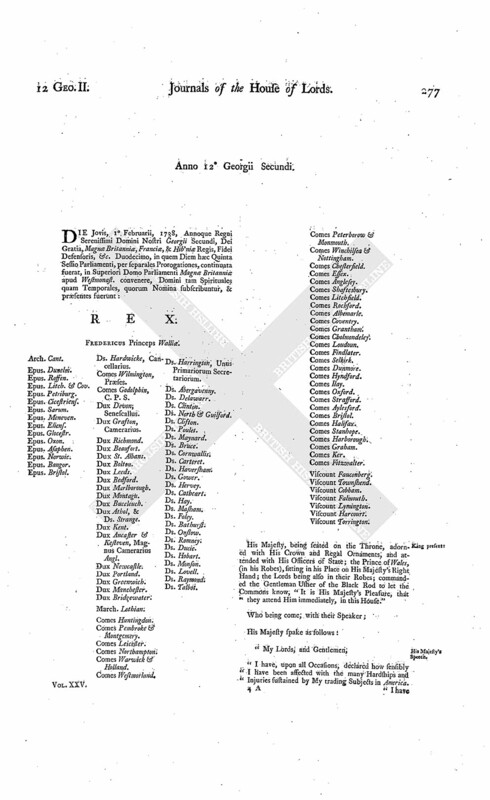 Upon reading the Petition of Francis Garvan Gentleman; praying, "In regard he has amended his Appeal, according to your Lordships Permission Yesterday; that Pierce Arthur, Barry Hartwell Clerk, and Maurice Fitzgerald, may be required to put in their Answer at such Time as this House shall prefix:"
It is Ordered, That the said Parties do put in their Answer or respective Answers thereunto, in Writing, on or before Wednesday the 14th Day of March next; and that Service of this Order on their respective Attorney or Attornies in the Court of Exchequer in Ireland be deemed good Service. Hamilton's Petition referred to Judges. It is Ordered, That the Consideration of the said Petition be, and is hereby, referred to Mr. Justice Chaple and Mr. Baron Fortescue; with the usual Directions, according to the Standing Order. Prohibited East India Goods, &c. Account delivered. 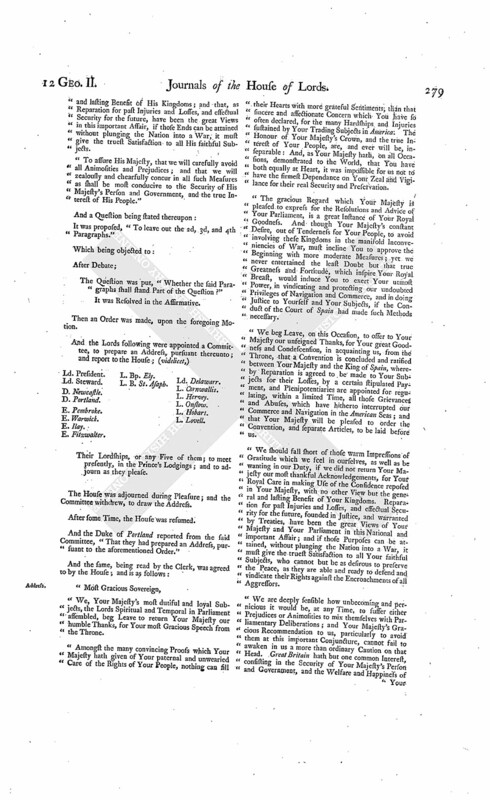 The House being informed, "That some of the Commissioners of the Customs attended:"
"The Report of the said Commissioners, with the Accounts of prohibited East India Goods, and Naval Stores imported, from Michaelmas 1737, to Michaelmas 1738." "No 1. An Account of prohibited East India Goods in the Warehouses at St. Hellens, approved by the Commissioners of the Customs, pursuant to an Act of Parliament, for the Reception of the said Goods; with what has been brought in, delivered out for Exportation, and now remains in the said Warehouses, between the 29th of September 1737, and 29th of September 1738." "No 2. An Account of prohibited East India Goods in the Warehouses at Leadenhall, approved by the Commissioners of His Majesty's Customs, in Pursuance of an Act of Parliament in that Behalf, for the Reception of the said Goods; with what has been brought in, and delivered out for Exportation, and what remains in the said Warehouses, from the 29th of September 1737, to the 29th of September 1738." "No 3. An Account of what prohibited East India Goods remained in His Majesty's Warehouse at the Port of London, at Michaelmas 1737; as also what brought in since, what exported, and what remained at Michaelmas 1738." "No 4. An Account of East India Goods prohibited to be worn in this Kingdom, remaining in the respective Warehouses in the Out Ports of England, at Michaelmas 1737; with what has been brought in since that Time, what exported, as also what remained at Michaelmas 1738." "No 5. An Account of Naval Stores imported from Russia into the Port of London, from Michaelmas 1737; to Michaelmas 1738." "No 6. An Account of Naval Stores imported from Russia into the Ports of England (commonly called the Out Ports) from Michaelmas 1737 to Michaelmas 1738." 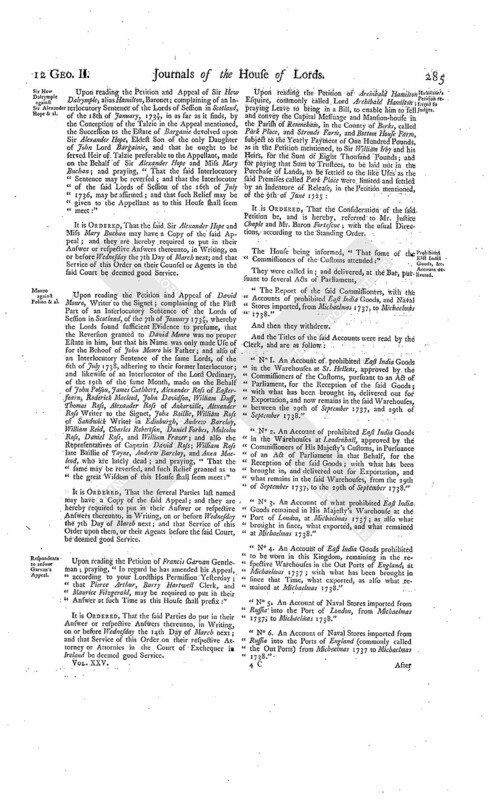 It is Ordered and Adjudged, by the Lords Spiritual and Temporal in Parliament assembled, That the said Petition and Appeal be, and is hereby, dismissed this House; and that the said Interlocutors therein complained of be, and the same are hereby, affirmed: And it is hereby further Ordered, That the Appellants do pay, or cause to be paid, to the said Respondents, the Sum of Fifty Pounds, for their Costs in respect of the said Appeal. Dominus Cancellarius declaravit præsens Parliamentum continuandum esse usque ad et in diem Jovis, octavum diem instantis Februarii, hora undecima Auroræ, Dominis sic decernentibus. 1. Ds. North & Guil. E. Fingall & al. against Naper & al. Upon reading the Petition and Appeal of Robert Plunket Esquire, commonly called Earl of Fingall, John Nugent Esquire and Margaret his Wife, Maurice O' Connor Esquire and Mary his Wife, and Edmund Nugent a Minor, under the Age of Twenty-one Years, by his Guardian and next Friend Robert Nugent Esquire, and Edward Hussey Esquire; complaining of a Decree of the Court of Chancery in Ireland, of the 11th Day of February 1737, as far as the same tends to charge the Lands in the County of Meath, from the 11th of January 1732, with the Interest of the Sums computed to be then due, for Principal and Interest, for and on account of several Sums awarded to the Appellants John Nugent and Margaret his Wife, and Maurice O'Connor and Mary his Wife, as a Principal or Gross Sum; and of that Part of the said Decree which directs so much of the Trust Terms in the said Lands in the County of Meath to be sold, as will satisfy the Respondents Principal and Interest thereby decreed to them; which Decree was made in a Cause wherein James Lenox Naper and William Naper Esquire were Plaintiffs, and the Appellants Defendants; and praying, "That so much of the said Decree as in the Appeal mentioned may be reversed and set aside:"
It is Ordered, That the said James Lenox Naper and William Naper may have a Copy of the said Appeal; and they are hereby required to put in their Answer or respective Answers thereunto, in Writing, on or before Thursday the 15th Day of March next; and that Service of this Order on their Attorney or Attornies in the said Court be deemed good Service. Gore & al. against Whitlaw & al. 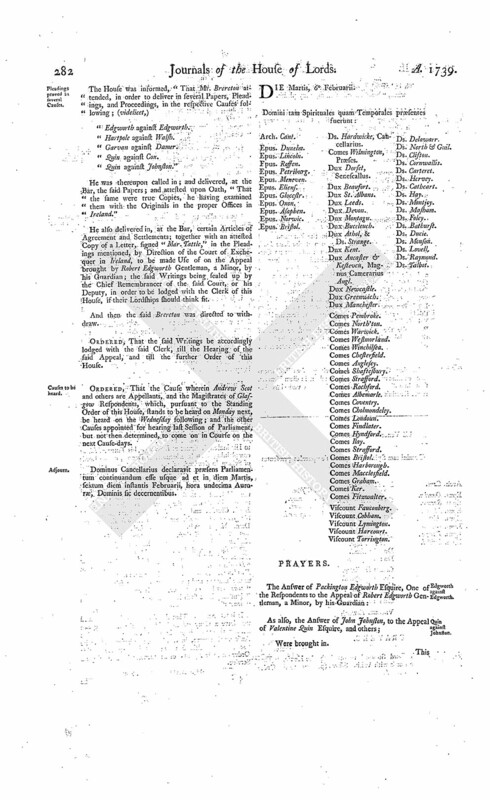 Upon reading the Petition and Appeal of Dame Letitia Gore, Widow of Sir Nathaniel Gore, deceased, Booth Gore, John Gore, Letitia Gore Junior, Angel Catherine Gore, Infants, Children of the said Sir Nathaniel and Dame Letitia, by Humphry Booth Esquire their Guardian, John Booth, Lewis Jones, and Arthur Earl of Granard; complaining of Two Decrees of the Court of Exchequer in Ireland, of the 26th of May 1731, and 22d of February 1732, made in a Cause wherein William Whitlaw Clerk and others were Plaintiffs, and the Appellants, or some of them, Defendants; and praying, "That the said Decrees may be reversed, varied, or rectified, and such Relief granted to the Appellants, and such Order made, as to the great Wisdom and Justice of this House shall seem meet:"
It is Ordered, That Alice Whitlaw Widow and Henry Donolly may have a Copy of the said Appeal; and they are hereby required to put in their Answer or respective Answers thereunto, in Writing, on or before Thursday the 15th Day of March next; and that Service of this Order on their Attorney or Attornies in the said Court be deemed good Service. It is Ordered, That the Petitioner have Leave to amend his said Appeal, as desired; and that the same do stand revived accordingly. Warren peremptorily to answer Roche's Appeal. The House was informed, "That Robert Warren, Respondent to the Appeal of John Roche and William Mahony Esquires, had not put in his Answer thereunto, though duly served with the Order of this House for that Purpose." It is Ordered, That the said Robert Warren do peremptorily put in his Answer to the said Appeal in a Week. The House being moved, "That Alexander Hamilton Gentleman, may be permitted to enter into a Recognizance for Mr. Hugh Murray Kynnynmound, on account of his Appeal depending in this House; he being in Scotland:"
It is Ordered, That the said Alexander Hamilton may enter into a Recognizance for the said Appellant, as desired. The like Motion and Order, for Henry Wemyes Esquire to enter into a Recognizance for Robert Hartpole; for a Reason of the same Nature. Dalrymple, for Sir Hew Dalrymple. The like Motion and Order for John Dalrymple Esquire to enter into a Recognizance for Sir Hew Dalrymple; for a Reason of the like Nature. Convention with Spain, &c. delivered. "A Copy of the Convention between Great Britain and Spain, concluded at The Pardo, January 14th, 1739, N. S. and Translation." Also, "Copy of the First Separate Article belonging to the said Convention, and Translation." And likewise, "Copy of the Second Separate Article belonging to the same Convention, and Translation." Together with, "Copies of His Majesty's and the King of Spain's Ratifications of the said Convention." Ordered, That the same, together with the other Papers thereto belonging, be taken into Consideration on Tuesday the 27th of this Instant February; and the Lords to be summoned. 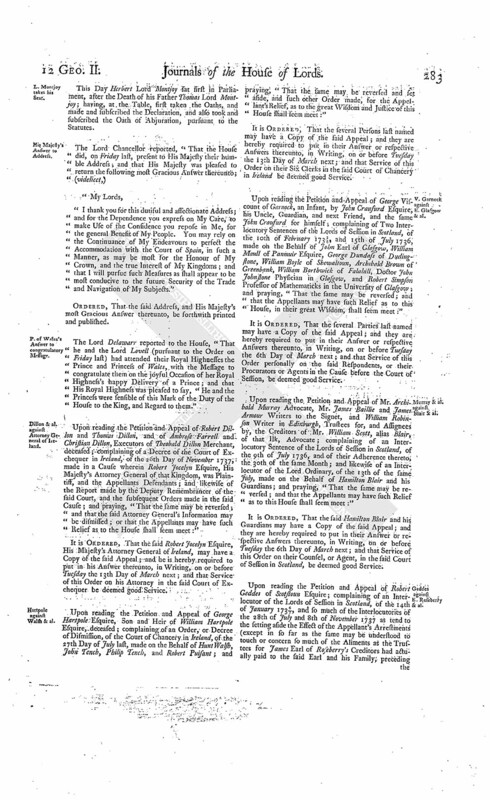 The House being informed, "That Mr. Edward Clancey attended, in order to deliver in several Papers, Pleadings, and Proceedings, in the Cause wherein Thomas Earl of Westmeath is Appellant, and Doctor Madden & al. are Respondents:"
He was accordingly called in; and delivered, at the Bar, the said Papers and Proceedings; and attested upon Oath, "The same were true Copies, he having examined them with the Originals, in the proper Offices in Ireland." In like Manner, Mr. David Jenkinson was called in, and sworn; and delivered in Copies of Papers, Pleadings, and Proceedings, in the Cause wherein Gerald Burke Esquire is Appellant, and Sir Walter Blake Baronet Respondent. And, having made the like Attestation, he was directed to withdraw. Dominus Cancellarius declaravit præsens Parliamentum continuandum esse usque ad et in diem Veneris, nonum diem instantis Februarii, hora undecima Auroræ, Dominis sic decernentibus. Gambier's Writ of Error Non pros'd. Upon reading the Petition of William Gale, Defendant in a Writ of Error depending in this House, wherein James Gambier Esquire, late Warden of The Fleet, is Plaintiff; praying, "In regard the Plaintiff in Error has not assigned Errors within the Time limited by the Standing Order of this House; that the said Writ of Error may be Non pros'd, with such exemplary Costs as to the House shall seem meet:"
He was called in; and delivered, at the Bar, the said Papers, Pleadings, and Proceedings; and attested upon Oath, "The same were true Copies, he having examined them with the Originals in the proper Offices in Ireland." Report, Commissioners of Greenwich Hospital, delivered. The House being informed, "That Mr. Corbett, from the Commissioners of Greenwich Hospital, attended:"
"A Report of the Commissioners of Greenwich Hospital, what Money has been received from the Derwentwater Estate, in the Year 1738; and of their Proceedings in carrying on the Building." And the Title of the said Report was read. Manners, a Satire, complained of; and Author and Printer to attend. Complaint was made to the House, of a printed Pamphlet, intituled, "Manners, a Satire; by Mr. Whitehead. Printed for R. Dodsley, at Tully's Head, Pall Mall." Ordered, That the said Whitehead and Dodsley do attend this House on Monday next; and the Lords to be summoned. It is Ordered, and Adjudged, by the Lords Spiritual and Temporal in Parliament assembled, That the said Petition and Appeal be, and is hereby, dismissed this House; and that the said several Orders therein complained of be, and the same are hereby, affirmed: And it is hereby further Ordered, That the Appellant do pay, or cause to be paid, to the Respondent the said Richard Allen, the Sum of One Hundred Pounds, for his Costs in respect of the said Appeal. Upon reading the Petition and Appeal of Robert Proof; complaining of a Decree of the Court of Chancery, of the 3d Day of July 1735, made in a Cause wherein the Appellant was Plaintiff, and Thomas Hines Defendant, and several subsequent Orders of the said Court; and praying, "That the same may be reversed; and such Relief given the Appellant as to this House shall seem meet:"
It is Ordered, That the said Thomas Hines may have a Copy of the said Appeal; and he is hereby required to put in his Answer thereunto, in Writing, on or before Friday the Twenty-third Day of this Instant February. Buchan against Sir Alex. Hope and Sir Hew Dalrymple. 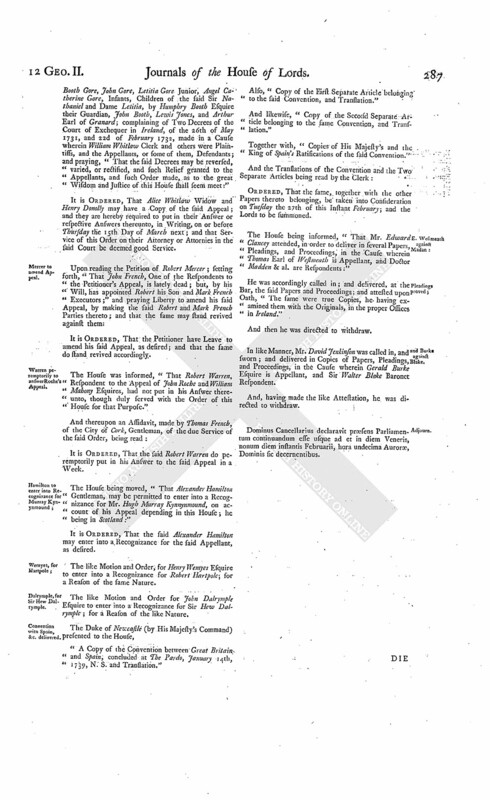 It is Ordered, That the said Sir Hew Dalrymple and Sir Alexander Hope may have a Copy of the said Appeal; and they are hereby required to put in their Answer or respective Answers thereunto, in Writing, on or before Friday the 9th Day of March next; and that Service of this Order on their Counsel or Agents in the said Court be deemed good Service. Marquis Annandale against E. and C. Hoptoun, et è contra. Ordered, That the Cause wherein the Marquis of Annandale is Appellant, and the Earl and Countess of Hoptoun are Respondents, et è contra, which stands to be heard on Monday next, be put off to the Wednesday following. Dominus Cancellarius declaravit præsens Parliamentum continuandum esse usque ad et in diem Lunæ, duodecimum diem instantis Februarii, hora undecima Auroræ, Dominis sic decernentibus. 1. Origin. Dundar; vide p. 291. b. &c.